Every manager or project owner wants to control development of their software but not all are able to do it. Aiming to make development clear for all participants of project the DevelopEx company has started to use the Swagger Framework — a tool for REST API representation and interactive documentation. That is especially useful for popular approach where we separate (web) services from front-end. Now the team members are able to view not only front-end of the project, but also play with back-end. And see how does it works inside. For one of our project we use our own API that written with ASP.NET WebApi. Our API implements a set of operations with common entities such as ‘Client‘, ‘User‘, ‘Order‘, ‘Certificate‘ and so on. And we use Swagger rules to describe the API. Since we did it we’ve got well described REST API methods that helped both customer, and developers and testers.The project became more clear and more stable. Let’s look at the User interface and the code for small part of API that is described by Swagger. 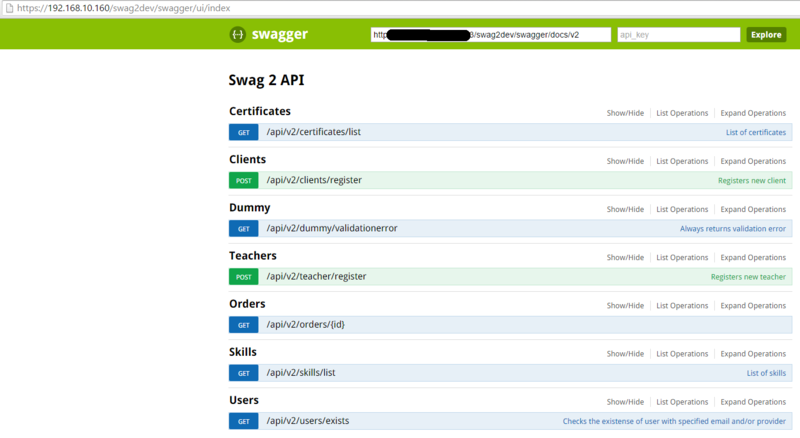 Screenshot #1 represents common general view of our API that converted to REST API by Swagger Framework. In our sample we have objects of API such as Certificates, Clients, Dummy, etc. Let’s see how both DevelopEx’s customer and our testers could estimate functionality the Client API. 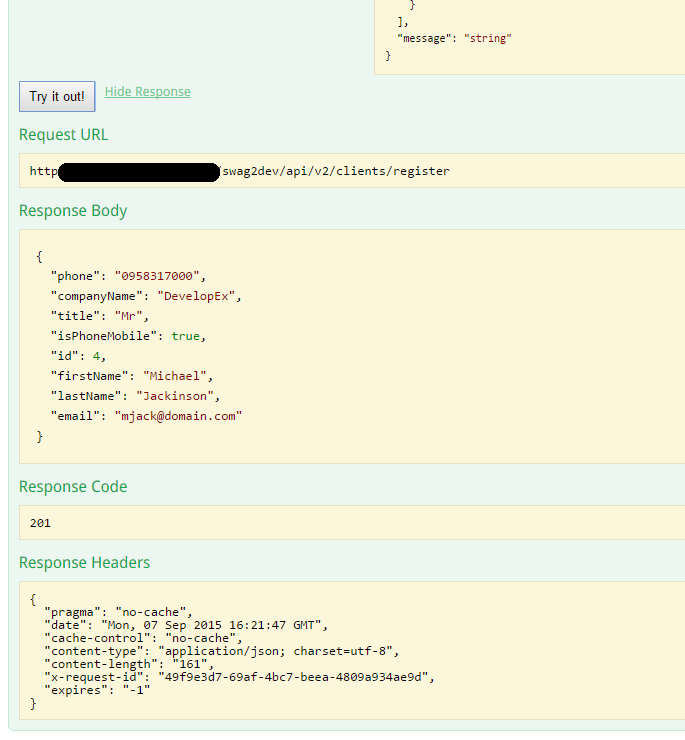 Look at the Screenshot #2, the right side of it shows JSON structure of data for Client entity. 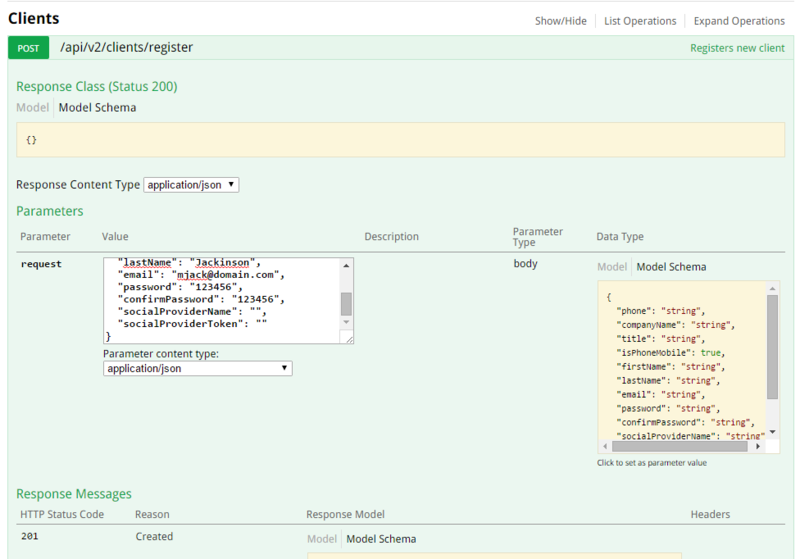 Look at the Screenshot #2, the right side of it shows json-structure of data for Client entity. For Client also accessible different API’s responses that will be in case of 1) valid values or 2) wrong values (ClientRegisterResponse and ValidationErrorResponse respectively, Screenshot #3) when we try to create a new Client. But how to check it? Click on data type of Client entity, immediately its structure is copied to the left side of Client viewer and stay editable. Input needing data (‘string‘ for string, etc. ), press ‘Try it‘ button and see how the API treat the request. In case of correct values we receive something like on the Screenshot #4. There is nothing like clear code, isn’t it?! 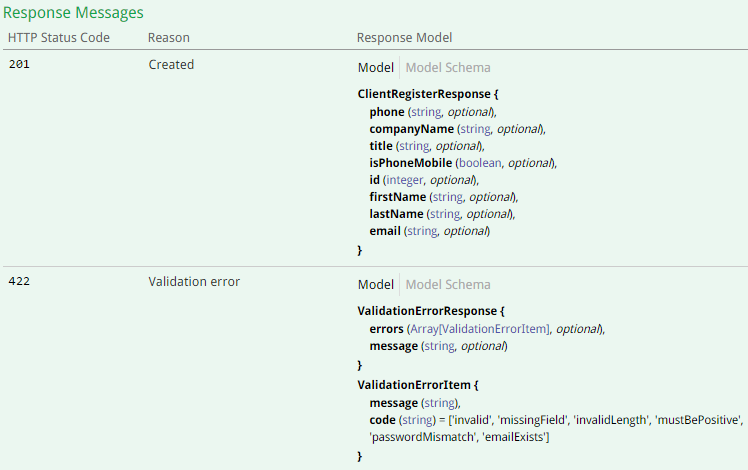 Finally, let’s look at those part of code where REST API describes new client registration. [SwaggerResponse] are attributes that Swagger uses to define how the API should proceed the queries. ability to check a software deeply and easier, for both testers and customer too.